Industry experts decipher the benefits of continuity of care documents and their importance to the electronic movement. Is there a difference between CCRs and CCDs? How does a CCD align with CDA? Should your organization plan to integrate a CCD with an EHR? For the average healthcare professionals, some of these acronyms and questions may seem a bit foreign and serve as a source of confusion when it comes time to discuss how to get the most from their data-sharing options. Experts on the topic suggest that the CCD—otherwise known as the continuity of care document—is an important step toward reaching the overarching goals laid out for the next phase of meaningful use and beyond. While it may be easier to avoid delving into the intricacies of these concepts, healthcare organizations that want to position themselves at the forefront of the electronic movement should make an effort to gain an understanding of a CCD’s benefits. Essentially, a CCD is a Health Level Seven International (HL7) XML standard that serves as a summary of core patient data. The information included in the summary represents the basics of patient data exchanged among providers, healthcare organizations, payers, and public aggregators of clinical data. This includes administrative, demographic, and basic clinical facts about a patient’s health covering one or more healthcare encounters. The beauty of the CCD is that it is an industry-accepted standard that provides a “human-readable” and an “EHR-readable” summary of patient data that can be shared electronically. In other words, it provides a method for one healthcare organization to aggregate all pertinent data about a patient and forward it to another practitioner, system, or setting to support continuity of care. While the details of how CCDs come together and are effectively integrated into an EHR setting may seem complex to the average HIM professional, experts emphasize that most clinicians will be very interested in and happy with the end result. van Terheyden points out that consumer interest is going to be driven by the value of the standard and proposition going forward. “If your provider and hospital are all connected, we’re going to be able to save you time … and give you control,” he says. 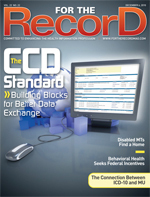 The acronyms CCD, CCR (continuity of care record), and CDA (clinical document architecture) have been part of EHR, information sharing, and interoperability discussions for several years. Confusing at best, each of these terms represents a piece of the movement. However, experts tend to agree that the CCD is the element that sets the stage for the next phase of meaningful use. Adopted in 2007, the CCD represents a merger of the CCR and the CDA in that it covers the same information as the CCR but is built on top of the CDA framework. The new CCD standard was formed through a joint collaboration of HL7 and ASTM International to address the divide that exists between providers who have adopted the CDA and those who have adopted the CCR. Endorsed by the Certification Commission for Health Information Technology in 2008, the CCD is predicted to be a key player in the electronic data exchange movement as the industry heads into phase 2 of meaningful use. In fact, CCD use is required for several phase 1 meaningful use criteria. The brainchild of HL7, the CDA is an XML standard intended to provide the electronic framework and semantics for the interoperable exchange of clinical documents across networks. A number of document implementation guides, including those for history and physicals, consultation and operative notes, and diagnostic imaging reports, have been developed using this framework. According to Alschuler, the CCD offers more efficient and more accurate continuity of care because it enables providers to reuse structure in clinical documents. Designed in a series of templates representing core areas ranging from presenting problems and family history to procedures and medications, the CCD provides a basis to reuse data in a way that will create efficiencies for quality, reimbursement, and data exchange with groups outside of a hospital’s EHR framework such as public health departments. “These templates are building blocks for reuse across the country,” Alschuler says. Dolin notes that the CCD is becoming an important tool for the Centers for Disease Control and Prevention (CDC) and that “it’s been nice to see templates of CDA being reused the way we had envisioned. “Most EHRs keep track of problem lists, medication lists, and labs. … The idea is that I push a button and out pops the CCD with all the basic information,” he explains, adding that the document can also be imported into other applications for decision support. In the case of the CDC, which collects public health information, it will ideally be able to receive information from multiple systems across the country in a standard format. According to van Terheyden, one of the greatest challenges facing today’s providers is the repetitive nature of gathering data. For example, he recently overheard a complaint registered against a pediatrician who had installed an EMR. While impressed with the practice’s technological advances, the patient’s parent felt the physician was more involved in data entry—inputting the exact same information that had already been collected by other providers—than in patient care. “We don’t share effectively,” van Terheyden says. However, with the CCD, the foundational elements of patient encounters are already captured through templates. In fact, reusable CCD templates provide built-in integration with primary clinical documents such as discharge summaries, history and physicals, consult notes, and diagnostic imaging reports. “The templates are building blocks that can be used and reused between clinical notes, CCD summaries, EHRs, and PHRs,” says Alschuler, adding that these form the basis for the Health Story/HL7 series of common document types. It’s a first step but not all encompassing, say industry professionals about the CCD’s ability to serve as a full patient record. Currently, the CCD is set up in templates for the purpose of formatting structured data. While it covers key patient elements (see below), it doesn’t give the full picture of a clinician’s thought processes. Dolin cautions that the CCD is a “salient high-level summary not to be confused with a full EHR” that works well in situations where data must be transferred to meet basic healthcare needs. Examples of such scenarios include exchanging information in the context of PHRs, triage, administrative functions, and decision support. On the consumer side of the equation, a CCD could be used to provide an acute care summary to be kept within a PHR, data that may be used for personal health advocacy and management or direct exchange of information from a nursing home into a PHR. For the transfer of care, a CCD supplies an effective initial summary for triaging patients in a number of settings, including home health, nursing homes, acute care, and assisted living. Interdisciplinary care and coordination of care receive a boost from the standard’s ability to provide electronic data geared toward research and administrative functions. Healthcare professionals agree that the CCD will be a moving target going forward and that this is a first step to the process of making the standard complete and user friendly. van Terheyden says it was important to start simple when it came time to present this form of data exchange to the healthcare industry as a whole. “Medicine has just gotten more and more complex” in the United States, he says, noting that a more basic approach could hold value. For example, he recently attended an educational session in which the presenter explained how a foreign country lacking the resources of the United States managed to set up a successful data-exchange program. The CCD concept could fall in line with that type of thinking. “The key to success is to take that first, small step,” van Terheyden says. Some of the latest developments, according to Dolin, include a draft of a series of new templates. As part of that process, van Terheyden says stakeholders will gather feedback as groups implement the standard with the hopes of making the CCD simpler in the future. The ultimate goal for CDA backers is to get the standard to present a thorough narrative of why clinicians made the decisions they did while caring for a particular patient. Such a capability would paint a clearer picture of the reasons doctors are selecting certain treatment methods and strategies.